Home Depot employee Richard Balderson helps a customer load plywood into his truck as residents prepare for the arrival of Hurricane Florence on September 11, 2018 in Myrtle Beach, United States. The Home Depot has announced they plan on hiring 300 associates at their stores throughout Southwest Florida, according to a press release. Spring is the company's busy season and they need to fill jobs to meet demand. There are permanent part-time and seasonal positions available from sales and cashiers to operations and online order fulfillment. College students, retirees and veterans are encouraged to apply. Applying for a job at The Home Depot only takes about 15 minutes. Just click here to apply. 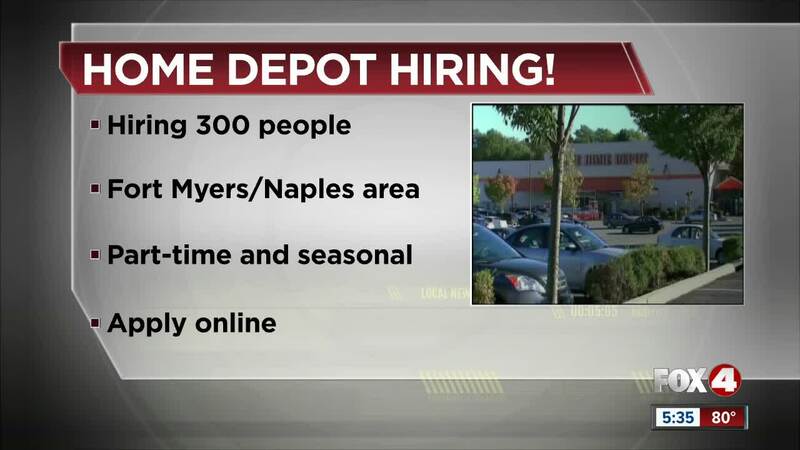 The Home Depot is accepting applications for positions in the Fort Myers/Naples area. The positions available vary by store.